With our great views, amazing food, easy access to spectacular natural terrain and a rich and vibrant cultural scene, the quality of life in San Francisco has long been considered to be one of the best in the country. But like many cities around the country, we too are feeling the pinch of the economic recession. These tough economic times have had an impact on our treasured neighborhood commercial districts, leaving storefronts empty or underutilized. In an effort to stem the negative effects of this recession, last summer I announced a new and innovative program that looks to the City's creative community to help turn the tide and bring new energy to some of our most challenged neighborhoods. A pilot program, Art in Storefronts, temporarily places original art installations by San Francisco-based artists in vacant storefront windows. Instead of simply placing existing artworks into these spaces, we chose artists who live or work in the neighborhood and challenged them to make work that speaks to the community. By partnering with community-based arts and economic development groups in each neighborhood, we were able to effectively engage property owners, convincing them that putting art in their storefront would not only beautify the area, but potentially help lease their space as well. We found property owners to be surprisingly amenable. And, almost 200 artists responded to our call. The results have been both exceptional and powerful. 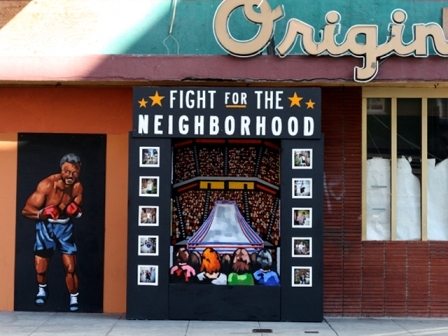 Chris Treggari and Billy Mitchell's installation reminds us of the Tenderloin's historical connection to the sport of boxing. They created a boxing gym installation with photos of local residents that also serves as a reminder to stand up and fight for the neighborhood during tough economic times. Their project is especially poignant because of its location: Original Joe's restaurant, a San Francisco institution that closed down recently. 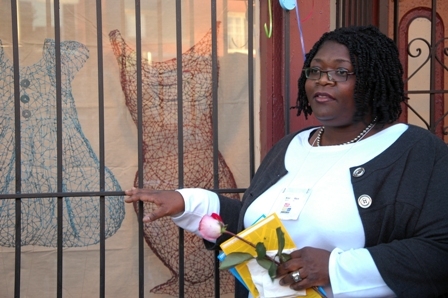 Kristine Mays' installation, Strong Women Precious Pearls, in the Bayview district of San Francisco, honors the hard-working women who are tasked with holding many households together. Her sculptures, created from hundreds of pieces of wire, reveal the essence of three generations of women. She told me that just as a pearl is created by an oyster that has been irritated by a grain of sand, the women in her life have become the beautiful women they are from the friction in life. 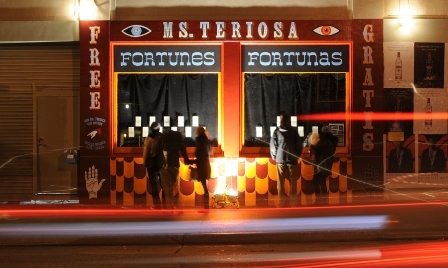 Kelly Ording and Jetro Martinez fashioned their installation, Ms. Teriosa, to represent a fortune-telling business in bright colors to blend in with the other business in the Latin-flavored Mission District. People fill out a card to ask "Ms. Teriosa" (a play on the Spanish word misteriosa, which means mystery) a question about their future. The questions are answered and displayed in the window revealing the collective hopes, dreams, and fears of the community. Our launch event in October in the Tenderloin and Central Market Street, two neighborhoods that have long struggled with homelessness and high rates of substance abuse, was a testament to the transformative power of art. Elders danced on the sidewalk, friends cruised along Market Street to check out the thought provoking contemporary art for free, and yes, folks even spent cash at the local bars and eateries. Following this initial launch, Art in Storefronts has rolled out in the Bayview and Mission districts of San Francisco. After these storefront unveilings, neighboring business owners have reported an increase in foot traffic and have told me that the art has made the street more inviting. Artists have garnered recognition for their work, which has resulted in gallery offers and other job prospects. Visitors and locals are gaining a better understanding and appreciation for San Francisco's tremendous creative community, which is one of the things that make our city so special. And residents are now seeing their neighborhoods with a fresh new perspective. The program has supported 20 installations in four neighborhoods that will remain up until the end of January 2010. We are working on launching Art in Storefronts in Chinatown and I want to scale this program into more neighborhoods. Art in Storefronts isn't the answer to a down economy, but it's one part of the solution. While we work towards an economic recovery, we can now view some wonderful art, get to know our neighbors and think about how we don't necessarily need a tax credit or a stimulus package to drive business and put people back to work. For more information, please visit www.sfartscommission.org/storefronts. Join Mayor Newsom on Facebook. You can also follow him on Twitter.